I’ve been wanting to make this entry for a while now and I am glad I’ve finally put it up. How often have we mums struggled to figure out what portions of food to offer to our toddlers? Especially when their need for food can range from ‘endless pit’ to ‘don’t even want to look’! I am almost always wondering about the portion sizes to offer to T. Though as a thumb rule I don’t force him to eat. I figured if he’s hungry he will eat it, if not I’ll try again later. I don’t particularly go about presenting him with several options unless he is sick or there is a genuine reason for me to ‘cave in’. A report on the infanttoddlerforum.org states that ‘Parents can be reassured that when young children eat a variety of foods in amounts within the range of portion sizes recommended, they are eating adequately. Knowing that the small portion sizes of some foods at the lower end of the ranges are adequate can reassure parents who worry that their young children are not eating enough of certain foods.’ Now thats comforting to know isn’t it? Here’s a portions to age chart I’ve put together after a little research. I try my best to give him all the food groups in a day. Though, may not be in the same serving sizes mentioned. But then again each child is different and the amount they eat will vary from day to day! 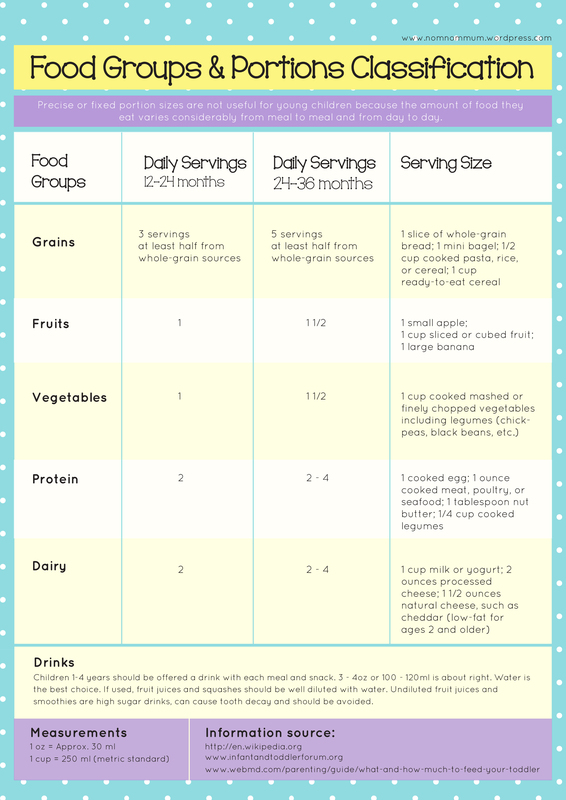 How do you manage your toddler’s food portions? I’d Love to know.